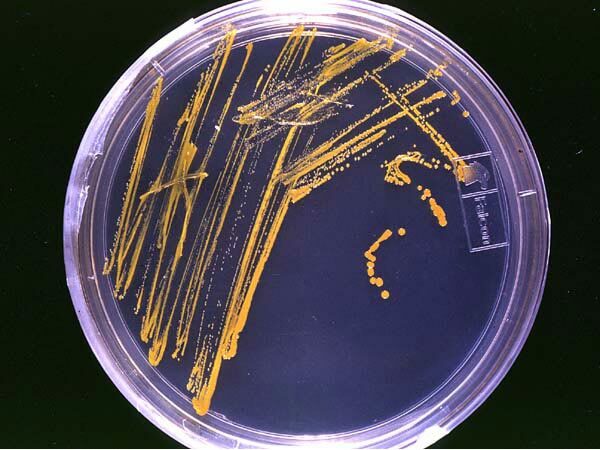 The easily recognized, circular, slim glass petri dish has been a mainstay of microbiology research since the late 1870s, when it was invented by Julius Richard Petri, an assistant to the pioneering German microbiologist Robert Koch. Filled with agar, a jelly-like substance, obtained from algae, which has been infused with selected nutrients, the petri dish becomes a go-to habitat for cultivating a variety of microbes, everything from bacteria to small mosses. But for all its successes as an instrument of biological and biomedical studies - and they are legion - petri dishes fall short in some regards. In particular, once the liquid agar and its mix of nutrients and any other selected chemicals set, you're pretty much stuck with the environment for your microorganisms that you decided on in advance. But what if you wanted to do an experiment that required you to change the nutrient environment over time? Are there options to using the tried-and-true, but inflexible, approach that the petri dish has to offer? An answer can be found in the so-called lab-on-a-chip, like the set of five pictured here on a wafer fabricated by Georgia Tech School of Biology graduate student Lijian Long and used by the McGrath lab there to direct the evolution of a tiny roundworm with the official name C. elegans. These are microfluidics devices. 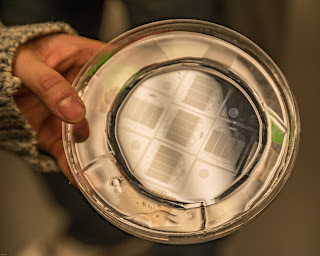 They resemble computer chips for a good reason: they are constructed using the same micro-scale techniques used to make those components so central to our digital technology. The key difference is that, unlike computer chips which are designed to control the flow of electrons, microfluidics devices are designed to allow for the exquisite control of the flow of fluids. In this case of the McGrath research group, the fluid being controlled contains, in part, bacteria found in decaying organic matter, a preferred meal for C. elegans. (Nom, nom, nom, as they say.) The roundworms, only around three-quarters of a millimeter in length, take up residence in the winding, narrow channel inscribed on the microfluidics device and feed on the bacteria that come their way. By modulating the concentration of these bacteria, among other things, the McGrath lab is able to interfere with the usual development of C. elegans with the intention of driving the evolution of specific traits, for example those having to do with lifespan. These kind of innovative labs-on-a-chip were developed early on by Georgia Tech School of Chemical & Biomolecular Engineering Professor, Hang Lu. They are wonderful examples of how science proceeds not only through the production of remarkable primary discoveries but also through the development of ingenious auxiliary experimental techniques which require thinking outside the box. In this case, one could say, thinking outside the petri dish.